"Wonderful, eggy, cheesy snack for lunch boxes, picnics, etc. Quiche without the pastry. A real favorite - and a sneaky way of getting veggies in to the family. Sets firmly enough to dip into sauces." Preheat the oven to 350 degrees F (175 degrees C). Grease a 6x10-inch baking pan thoroughly with oil. 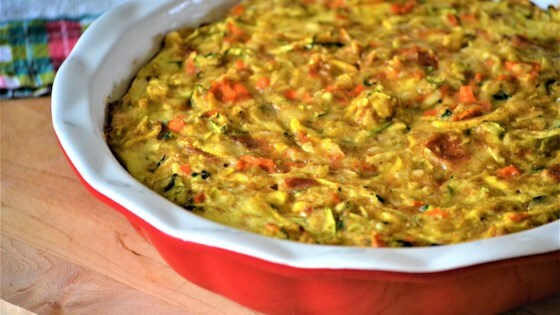 Mix zucchini, eggs, onion, flour, carrot, bacon, Cheddar cheese, salt, and pepper together in a large bowl. Pour into the prepared baking pan. Bake in the preheated oven until fully set, 30 to 40 minutes. Cool before slicing.